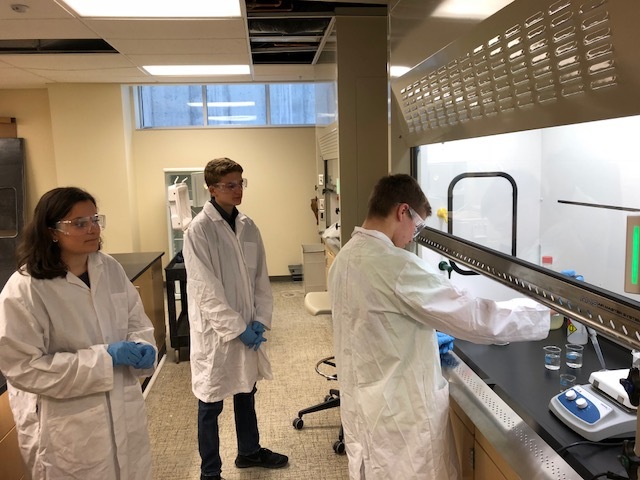 The Lewiston-Porter High School student researchers performing an acid digestion of fish tissue in the newly built Chemistry Research Lab (SASE 006). 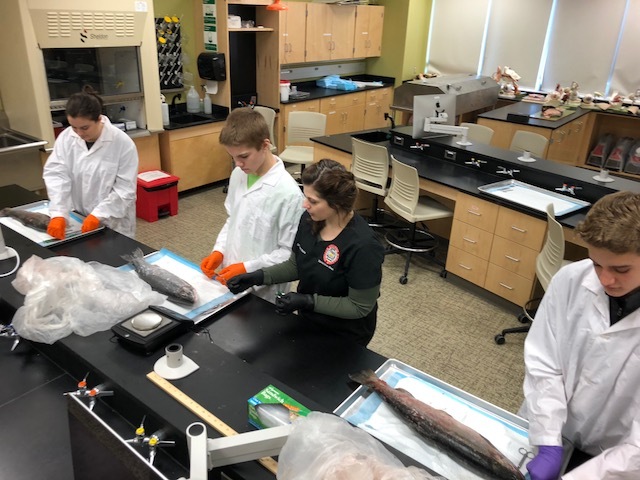 Dr. Stacy Ruvio instructing the Lewiston-Porter High School student researchers on how to begin their fish dissections in one of the Anatomy Labs (SASE 204). 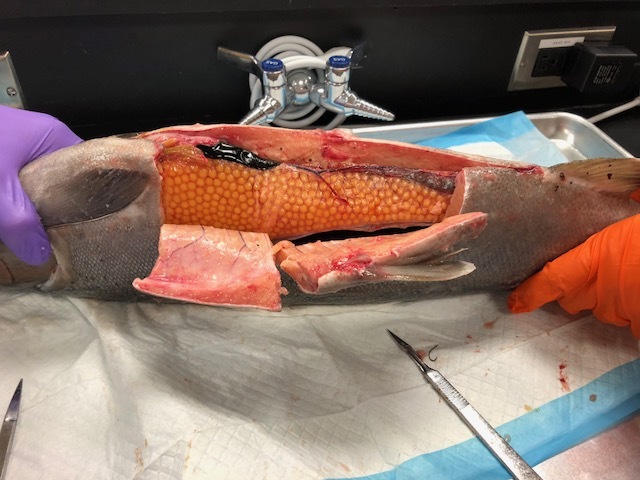 A partially dissected fish showing the eggs (in yellow) and spleen (dark organ on top); two tissues that were collected for analysis. 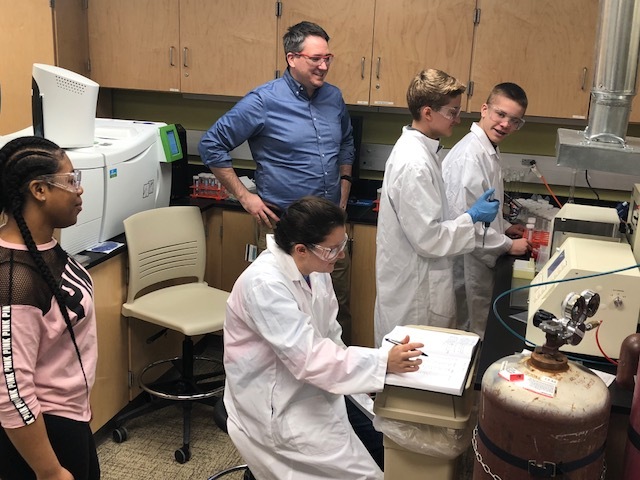 Dr. David Stewart and Timeka Snead supervising the Lewiston-Porter High School student researchers while they analyze samples using the Atomic Absorption Spectrometer (SASE 007). For the past five years, Dr. David T.R. Stewart, Assistant Professor of Chemistry, has been working with Lewiston-Porter High School science teachers Michelle Hinchliffe and Colleen Glor to engage high school students in scientific research at D’Youville College. Each year, three high school students are chosen to develop, execute, and present a research project at the International Student Science Fair (ISSF). Dr. Stewart has been providing necessary research materials and analysis to help these projects succeed. This year, Dr. Stewart and the Lewiston-Porter team are collaborating with Dr. Stacy Ruvio, Assistant Professor of Biology, to investigate the distribution of the heavy metal lead in the bodies of fish caught in the Niagara River. The students will be presenting their research findings at the ISSF in Chicago this summer. The International Student Science Fair is an invitation-only conference for high school students to share the results of their research and to meet their peers from across the world. It is a week-long experience packed with seminars, research lab tours, and trips to local attractions. Lewiston-Porter is one of only two schools in the United States to participate in the ISSF. In this year’s project, the high school students are interested in understanding the strengths and weaknesses of the methods used to determine if fish in the Great Lakes are safe for human consumption. While sport fishers will typically eat only the fillets of the fish they catch, the consumption advisories are based on full-body concentrations of toxic substances. Since toxic substances are often more concentrated in fatty tissue and the organs used to process wastes, eating fish may be less hazardous than the consumption advisories warn. However, there are many people in Western New York who fish to supplement their diet and are more likely to eat all, or most, of the fish they catch. The students first visited D’Youville College in January to discuss the research project and plan experiments. In February the students returned and used one of the Biology Department’s Anatomy labs. Under the guidance of Dr. Ruvio, the students dissected several fish and removed tissue samples of interest. The students then analyzed the lead in each sample using the Chemistry Department’s Atomic Absorption Spectrometer under the guidance of Dr. Stewart. The spectrometer can measure lead down to the part per billion level ensuring that even trace amounts of lead will be detected. D’Youville Biology BS student Alexandria Cummings and Chemistry BS student Timeka Snead are also working on this collaborative research project as part of their BIO 407 and CHE 407 Research at DYC Direct Studies. Currently, there are few set standards for the expectations for student work in Research at DYC Direct Studies. Drs. Stewart and Ruvio are using their scientific research project as a basis for an educational research study to improve their teaching practices in Research at DYC Direct Studies. Upon conclusion of that study, they will present their findings and propose strategies and recommendations to advance all DYC science research courses. If the setting of expectations and outcomes for undergraduate research at DYC is of interest to you, please contact Dr. Stewart or Dr. Ruvio to join their ongoing discussions.